Pickup from Delhi Railway Station / Airport, drive to Chandigarh. Check in Hotel. Afternoon visit Rock garden and other sightseeing spot. Dinner & Overnight stay at Hotel. After breakfast, drive to Dalhousie. Check in Hotel. 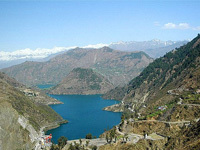 Dalhousie was established in 1854 by the British Governor General Lord Dalhousie. Built around five hills Dalhousie is clothed in stately groves of deodar and oak. Its marvelous forests trails overlook vistas of wooded hills, waterfalls, springs and rivulets. Dalhousie still has a touch of the "Raj" and its colonial style buildings and houses bring back the flavors of an earlier era. Dinner & Overnight stay at Hotel. From here we proceed to Chamba enroute visiting Khajjiar. Located at the center of the sloping meadows is a small bog-like pond into which water from the surrounding meadows and forests drains. Khajjiar was probably a glacial bowl formed during the last Himalayan ice age and left with a lake that gradually withered away. Khajjiar is part of the notified Kalatop-Khajjiar sanctuary. The Monal Pheasant, a bird which was fairly common till recent times has become relatively difficult to spot nowadays. Dinner & Overnight stay at Hotel. After breakfast, drive to Dharamshala. 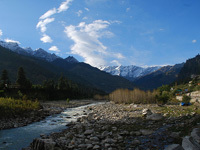 Mcleodganj is a famous little town of Dharamsala also known as "Little Tibet". H.H. The Dalai Lama resides here. At the start of Mcleodganj is a small bazaar filled with variety of Tibetan handicrafts and artifacts. At the end of the spur lies the Namgyal Monastery .The external wall is surrounded by rows of prayes wheels. Within the monastery are large idols of Buddha, A valokteshwara and Padamsambhava and walls lined with Thankas. Dinner & Overnight stay at Hotel. After breakfast, drive to Manali. Check in Hotel. Dinner & Overnight stay at Hotel. After Breakfast, drive to Shimla. On Arr. transfer to Hotel, dinner & overnight stay at Hotel. After early breakfast, visit Timber Trail Hill. Later drive back to Delhi. On Arr. Delhi, transfer to Railway Station / Airport.